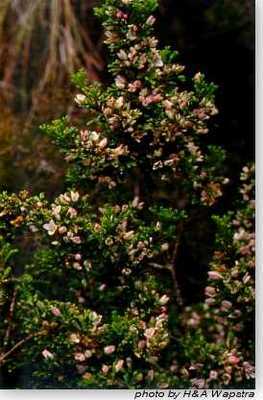 Erect shrub, variable in leaf size. Leaves are long stalked, sticky and very glandular. Local in the south on dry hillsides and near the north coast. Susceptible to Phytophthora cinnamomi. When leaching to grow from seed, and after nicking the hard seed coat, wrap the seeds in a muslin bag. Tie the bag at the top and secure in a container, say a bucket or watering can, under a running tap for about 10-14 days. The bag may be secured in a toilet cistern where seeds are leached when toilet is flushed. Suitable below powerlines.